I am just going to put this out there….if you are like me and have hated…I mean really HATED pinto beans your entire life, I beg you to give these a chance. Now, I know I will probably get some flack from old timers who just can’t wait for a bowl of pintos and greens. But not this girl. I seriously couldn’t even stand the smell of them. That being said, my friend Deb was over and she really wanted to make our family beans and rice. She happens to be from Brazil. I was really not looking forward to it. But how do I tell her that I am the last person in the world who is going to eat them? I just couldn’t. Instead, I told her that my kids may not eat them. I know, I’m a whimp. The moment of truth comes and I have to eat the dreaded beans… INFRONT of her. I took the first bite. Instead of dying, like I thought I was going to, I actually couldn’t believe how amazing they were! I didn’t shut up for probably 30 minutes, talking about how awesome they were. I also confessed my dread of pinto beans to her. I loved them so much that I asked if I could share her recipe so that other pinto haters could become lovers just like me. I have seriously made these at least once a week since then, and my kids (including little Logan) eat them up. The funny thing is that traditional pinto beans and Deb’s Brazilian beans only have one major difference that I can tell. Lots more garlic. I can’t believe one simple ingredient can change everything. But it does. 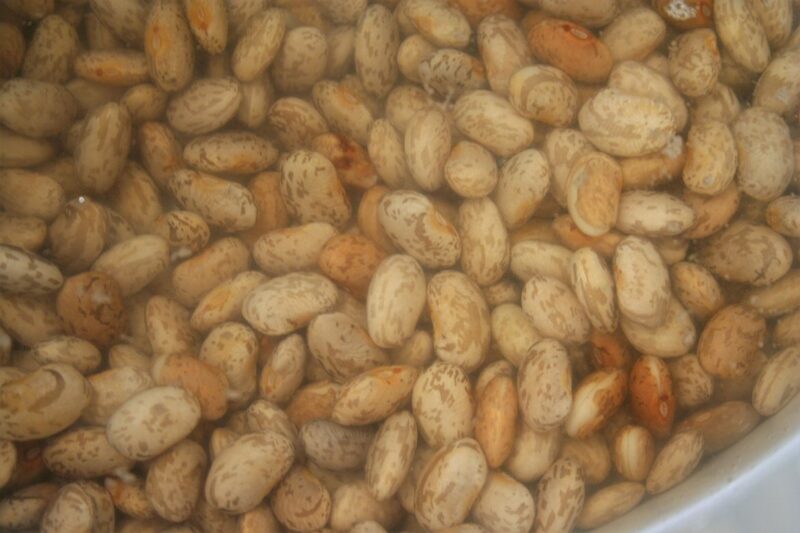 Place beans in a large bowl with enough filtered water to rise about 2 inches above the beans. Let sit overnight. A couple hours before you need to serve the beans, drain them and place them in a large pot with a lid. Cover with fresh filtered water till the water rises about an inch over the beans and place the lid on the pot. Cook the beans at a low boil for an hour or two, until tender. Note: I usually have to place the lid a little off center to keep the pot from boiling over, while still retaining some of the water that is trying to quickly evaporate. Keep an eye on the beans and if the water looks low you can add some as needed. Once the beans are tender remove from heat and use a potato masher and smash about 1/3 of the beans. This helps makes for a creamier texture. If the beans are too watery for your liking you can return them to a low boil with the lid off until it reaches desired consistency. In a separate pan heat your olive oil. Stir in the minced garlic leaving it until it’s just browned. Quickly pour oil and browned garlic into beans and give a good stir. Note: I usually use a large pot with a lid for this step and then immediately use it to make my rice. It helps flavor the rice nicely and saves a dish! 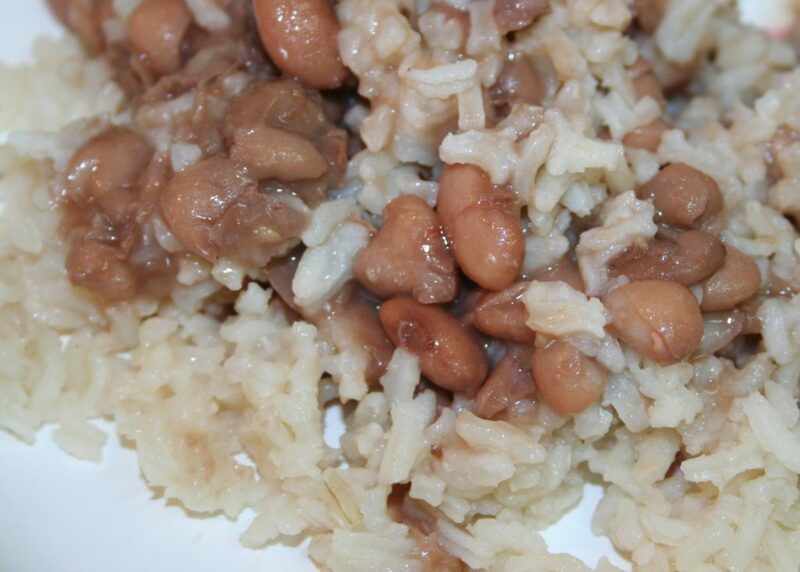 I tend to use a good amount of sea salt (1tbsp or more) in the beans because we almost always eat it with rice. But salt to your liking. Brazilians usually have this as a main dish with several different sides. So far I have only been able to get rice and beans on the table. When I say this is a cheap meal, I mean it is ridiculously cheap. This feeds our family of five at least twice and costs maybe $4 using all organic ingredients. To give you an idea on how much rice to make; I make 3 cups dried rice to six cups water/bone broth. I think that should yield about 6 cups cooked rice….maybe…kinda….okay I don’t know. But you get the idea. I hope that if you are a “hater” you will try these beans out and be amazed.